Manipulating the brain has been a tool used in the treatment of mental illness for centuries, and treatments have often been controversial. From psychosurgery, including lobotomy and leucotomy, to electro-convulsive therapy, which is still used to treat depression and psychotic illness today, more modern methods include deep brain stimulation and transcranial magnetic stimulation. These direct interventions to the brain aim to relieve the symptoms of severe mental disorders, but are generally a last resort for sufferers or used in the context of specialist clinical centres and research trials. We know that the brain undergoes changes when a person is depressed or has a similar mood disorder. But part of the problem with neuroscientific research is that it is unclear whether these structural changes cause, or are caused by, the illness. In an intriguing new study of depression published in the journal Neuron, researchers have investigated a new direct intervention technique to combat the symptoms and effects of depression. The team induced abnormal brain activity similar to depression in mice, and then manipulated various circuits of the brain to successfully control and reverse the effects. This suggests that brain changes could indeed be responsible for, and predate, the development of mental disorders. The implication is that with the right techniques, these changes could be reversed and so improve the patient’s mental disorder. The new technique works by implanting electrodes in four key areas in the mouse’s brain – the prefrontal cortex, and three sub-areas of the limbic system: the nucleus accumbens, the ventral tegmental area and the amygdala. By measuring electrical signals between these areas, neuroscientists were able to determine the functional connections between them and understand how these parts of the brain communicate with each other during normal brain activity. The mice were then repeatedly exposed to chronic stress in the form of “social defeat”, which refers to losing a confrontation in a social setting, and is known to cause behaviours in animals similar to human depression. Previously observed connections between areas of the brain were actually altered by this stress, creating a “neural signature” of depression in the brain as the researchers recorded how the neural signalling changed. 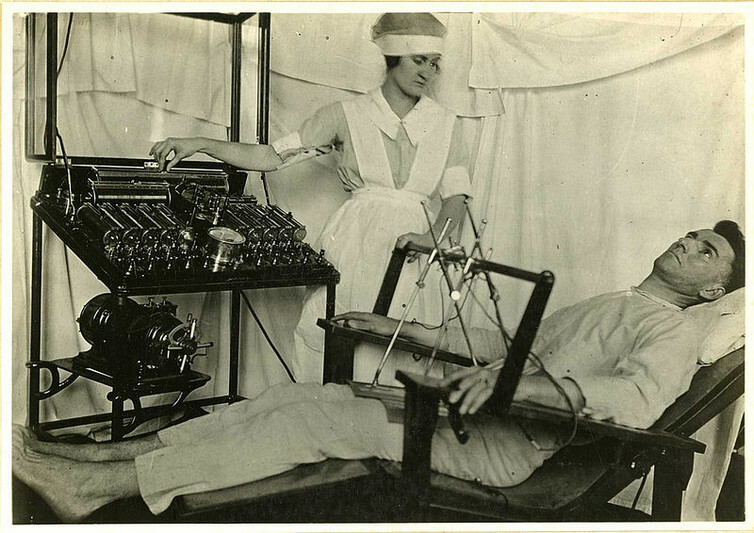 A World War I soldier being treated with an early analogue of ECT. ECT as we know it was developed in 1934. Amazingly, the team were able to reverse this abnormality in the stressed mice’s brain activity. By stimulating a key area of brain tissue which interfaces with other nodes to form a network between the prefrontal cortex and the amygdala, normal communication between the areas of the brain was restored, returning the mice’s brain activity to their pre-stressed state. Their behaviour returned to normal and their stress disappeared. This marks the first time a clear parallel has been demonstrated between a model of depression and a functional neural network. What’s more, these findings are well backed-up. The prefrontal cortex and limbic areas are already known to be connected to depression in humans. The amygdala is thought to have a key role in processing how important emotional material is to an individual, and how they respond to it – as the mice respond to their stressful situations. The wider limbic system and prefrontal cortex are important in regulating the impact that our emotions have on our cognitive abilities, such as memory, which causes us to behave differently when we are stressed or depressed. The key element of this research is manipulating the connectivity of the prefrontal cortex, for which there is further evidence that reinforces the idea that this could be crucial to treating depression. Transcranial direct current stimulation, which manipulates the brain in a similar way, is already being trialled as a treatment for depression, with results showing some evidence of a positive effect for sufferers. Since this study concurs with what we know about mood disorders, this could certainly open up new avenues for treatment. Exploring these new causal links between stress, the brain’s neural connectivity and depression might make it possible to tweak brain circuitry in order to reverse whole mood disorders – at least in mice, to begin with. The team’s findings not only help us to understand depression and other psychiatric illnesses, but also provide a powerful impetus toward developing treatments. Having a distinct “signature” of the mental disorder in question could be extremely useful as a reference point for new clinical treatments, and such a “screen” would facilitate more rapid and cost-effective testing of novel methods, encouraging more innovation and investment in these neglected areas.